If you’re like many new landlords just starting out in the property rental business, you have probably already made the decision to just “wing it” when it comes to the majority of your starting off points. After all, what could go wrong, right? Right? The truth is that there are way more pros than cons in hiring a lawyer who specializes in landlord / tenant law from the start to get yourself going in the right direction. You shouldn’t only consider hiring one only once when you really need one and already neck deep in water. Prevention is the best problem solving technique in my book. Here are some good reasons why you should hire and build a relationship with a good landlord lawyer to help you navigate the legal and expensive liabilities a landlord can incur with their real estate without a clear understanding of the law that can have a major impact on the profitability of your property investment. Nothing gets you off the hook easier than having a solid lease agreement with your tenants. Having a solid lease in my book is one of the best investments you can make. Make sure you provide the landlord lawyer you have chosen all of your concerns and points you want covered in the lease clauses. Remember that the lease is your safe way out of any potential future problems and small claims court hearings and that it is never finished. You will need to revise and revisit this item from time to time and when new issues arise. Most states try to promote an easy going and stress free eviction process, but the ugly truth is that it’s simply not the way they make it seem. Many landlords try to go in it alone only to find out that the form they submitted was not the right form. The date on which the form was filed was wrongfully filed a day before it was supposed to be filed. Then, once you actually figure out that jig saw puzzle of paperwork, you get to meet a judge who’s having a bad morning and just decides he doesn’t like the color of the shirt you are wearing. There’s no doubt that some potential tenants you reject through your vigorous tenant screening process will feel, well discriminated against. You will receive the very common “I will sue you for discrimination!” every now and then, but the fact is you need not worry 9 times out of 10. While most of the landlords consciously follow HUD’s guidelines to assure they are practicing fair housing policies to the best of their abilities, every now and then you will get the court order in the mail when a tenant decides to take the matter to court. If this is the case, you should think about lawyering up. If HUD decides to investigate the case, you are looking at a minimum fine of up to $16,000 per violation if it’s your first offense plus damages, fees and other fines. Hiring a lawyer can possibly help you resolve the issue before an administrative law judge sees your case and it can also help you stay away from bad press and bad business reputation. Any time a tenant or a guest of theirs claims they got hurt or ill because of your recklessness it is definitely time to hire a lawyer. Personal injury claims are almost always high case and very emotional, and the lawyers that take care of the prosecution know their way around the ropes a lot better than the average landlord. A good lawyer will refrain from attaching themselves to the case on a personal level and keep emotion out of the court room. These claims often arise when say a roof collapses due to weather or for not having the proper maintenance done to the roof and the tenant’s personal property gets damage such as appliances and furniture. While your liability insurance should cover the majority of these cases, it is a good idea to consider hiring a lawyer when the stakes are high. If the stakes are low, there is probably a solution before getting the case heard in small claims court. Hiring a coaching session to see how you should proceed is always a better idea than going into it alone. Let’s face the facts: a bad reputation is bad for business. Sometimes, things happen and you’ll need help crawling your way around the negative publicity and possibly straightening out your name so that the negative headlines are removed or changed. A lawyer can coach you through the process by telling what you should and shouldn’t say or even speak on your behalf. A good lawyer can also guide you to take actions to draw positive attention to your damaged property or business. You don’t only need a lawyer for tackling evictions or discrimination lawsuits as a landlord. You will find yourself eventually on the plaintiff side every now and then. You may decide to sue against a contractor who didn’t finish a job you hired him to do or he didn’t do it correctly. Or you may find yourself on the other side of the court bench again because an ex tenant wasn’t satisfied on how you used a portion of his security deposit. If you’re going to court for anything either as a defendant or plaintiff, it’s always a good idea to at least get some coaching from your lawyer who specializes in landlord and eviction law to make sure you have all your bases covered. The amount your lawyer should be involved will vary depending on the severity of the case, and the stakes at hand. You’ve been a sole proprietor for years and you have decided to get a partner involved in your business. It’s a good idea to get a lawyer involved to draft up important legal contracts and to have him take care of any filing of documentation you may need to make your restructured business legitimate. Any business restructuring will also have tax and other legal ramifications which your landlord lawyer could explain and handle for you. 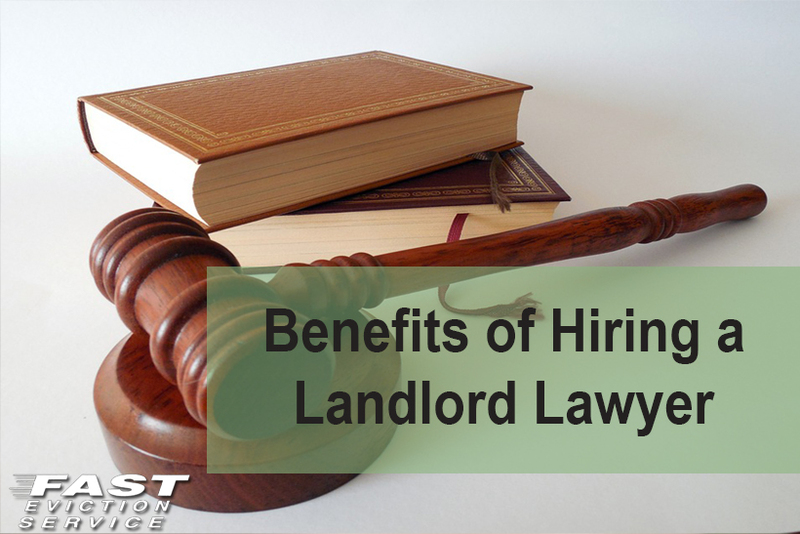 As you can see, there are multiple benefits in getting yourself acquainted and building a trustful and good relationship with a lawyer who specializes in landlord and eviction law. The team at fast eviction is always ready to help in any way they can and ready to serve you with all your legal needs.